...basking under my yellow sky...: Ceebla's Story. 'God created woman from a crooked rib and anyone who trieth to straighten it, breaketh it' - Somali Traditional Proverb...in English ofcourse (Hehe). 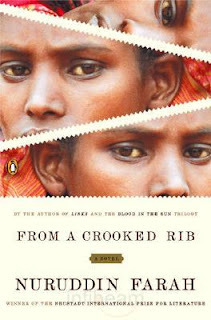 From a Crooked Rib" is a beautiful, sparse, subtle account of the experience of a girl named Ebla, who runs away from her rural family, settles in Mogadishu, the capital, and marries an educated man with unhappy results. Told with complete conviction from a woman's point of view, the story is a moving celebration of the human spirit and challenge to traditional male chauvinism.